Paytm Mall – Get Rs 200 Cashback on Purchase of Rs 299 or more (All users). 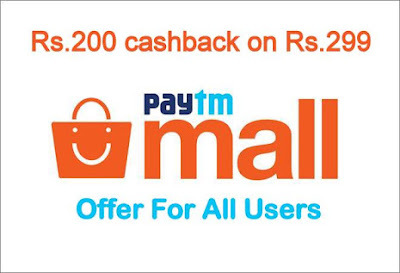 Paytm is offering an awesome offer on Shopping at Paytm Mall App, Get Flat Rs 200 Cashback on Shopping of Rs 299 or more. Maximum Cashback is Rs 200 per user. This promocode can be used only once per user. This promocode is valid for a Limited time only. So Hurry up and avail this offer now !! Note:- If you have availed this offer in Previous month, You can avail in this month too !! 1) First of all, Visit Paytm Mall website and Search for the product which you want to buy. Valid on almost all products except some grocery and FMCG category products. 4) Apply Coupon:- ONCEAMONTH to Get Rs 200 Cashback on Rs 299 or above for All Users. Note:- This Coupon will give you Rs 200 Cashback on Non- Daily need products and will give you Rs 100 Cashback on Minimum purchase of Rs 299 or more. You can see Your Cashback details by Applying Coupon code. 13. If product comes under no return policy, Cash back gets credited post 7 days of delivery date.This cash back offer is being extended by One97 Communications.